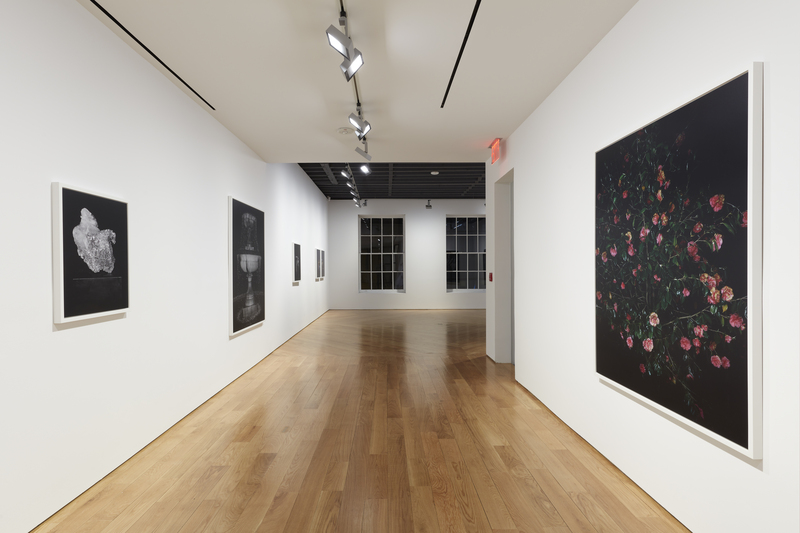 For her fifth exhibition at Anton Kern Gallery, New York, Sarah Jones introduces a new body of work that shifts between studio and location, night and day, limits and limitlessness. 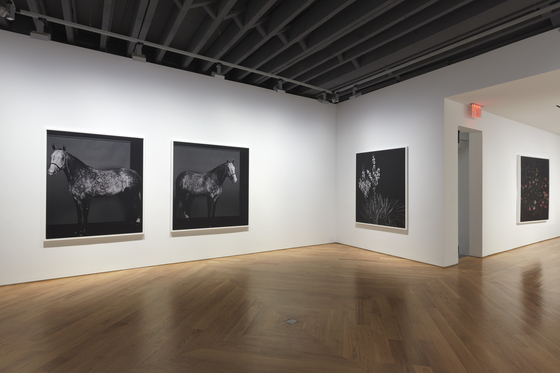 Her subjects are re-presented in two sizes: a small format for her still-lifes and a large format for photographs made outside the studio. These new works explore artifice, the complex relationship between reality and imagination, between the fixed and the hallucinatory. 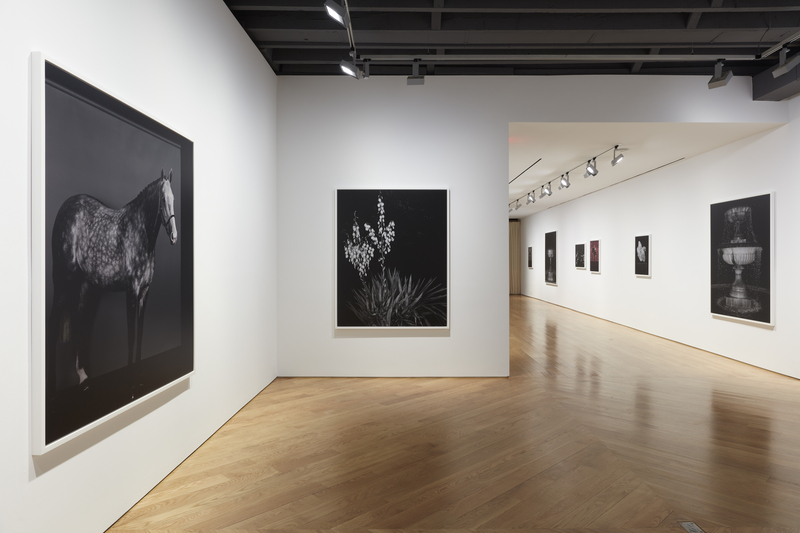 Using a large format field camera, and working with both black and white and colour film, Jones’ works depict a range of subject matter that share a sense of impermanence; cut flowers, cultivated plants, upended glass objects, water cascading down a waterfall. A horse is photographed from one side and then the other, fixing a transitional moment when its coat changes from grey to white. The water of an ornate fountain, located in Regent’s Park, is suspended mid-stream as if iced over. The surfaces of Jones’ subjects are both waxy and slippery, often disappearing into a distinctly black photographic matte space, and often appearing out from it. Only seemingly incongruous, these images are drawn together by the artist’s specific camera framing that references the Cabinet of Curiosities. Popular in the mid 1700s, displays of disparate objects based in fact and the fantastical represented the collector’s own ‘theatre of the world’ or ‘memory theatre’. Sarah Jones’ new photographs reframe our already cultivated natural world alongside an often glassy illusory one where nature is heightened and cultivated again through the photograph. 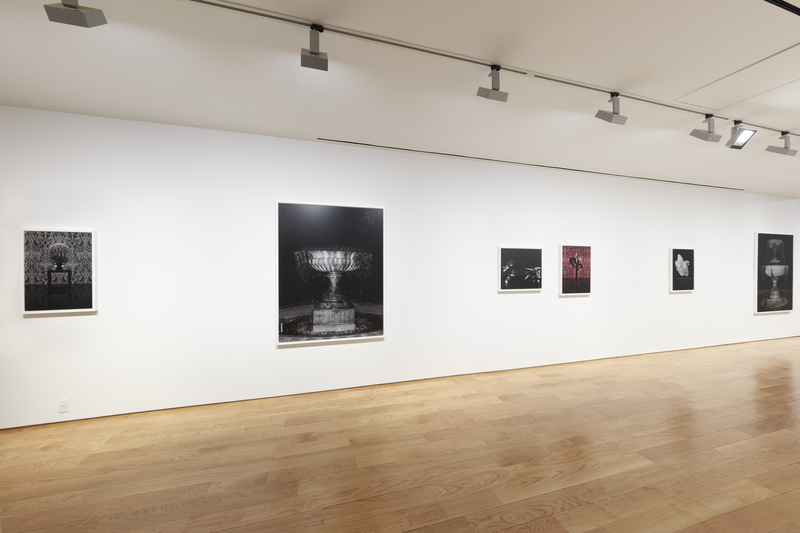 Sliding between black and white and colour, from still life to subjects in specific locations, Jones builds a distinct, peculiarly photographic, sealed world with its own logic, temporality and reduced space and palette. She stretches time, to slow down and extend silence and reverie.